I had the privilege to join the Muncie Noon Rotary Club in Celebrating their 100th Birthday! I have been a member of Rotary for about 5 years, when a commercial contractor that had built a development for us invited me to my first meeting. If you are not a member and don’t know anything about Rotary, I invite you to check out your local Club, you will not regret it! The Club that I am a member of, the Muncie Sunrise Rotary Club started in 1994 as a spin-off Club from our Big Brother which started life in 1917. Think about that, Muncie Rotary has been going strong for 100 years! A lot has changed in 100 years, but the more things change, the more important the mission of Rotary becomes. Rotary is not about fellowship with fellow business and community leaders, and sharing laughs over doughnuts and coffee or lunch. It is not about the guest speaker, and learning more about what is happening in your city or town. Rotary is about changing the World. 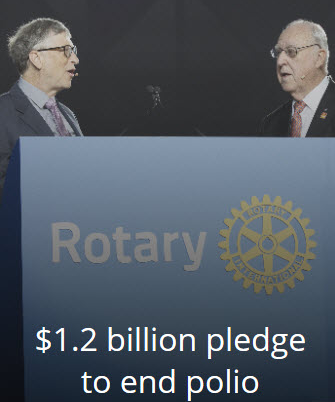 Rotary is a global network of 1.2 million neighbors, friends, leaders, and problem-solvers who come together to make positive, lasting change in communities at home and abroad. Think about what little Muncie Indiana looked like 100 years ago. In 1917 a group of men came together to make a difference in their community, and their legacy lives on. My Question to you…What are you doing to make a difference? In your life, in your family, your community, in this country, and in this world? You may only be one person, but join the Rotary Family and with 1.2 million members plus you, I guarantee that we will make a difference together. Like the men in Muncie 100 years ago, you can change the world.